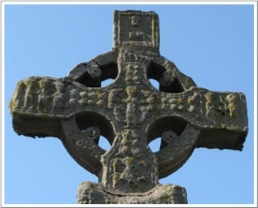 This page highlights Three High Crosses found in County Monaghan. They are: Clones, Old Donagh and Selloo. 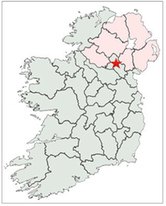 The location of County Monaghan is indicated by the red star on the map to the right. County Monaghan came into existence in 1585 following a conference of Sir John Perrot and a number of Irish chieftains. The leading family was McKenna. The population of County Monaghan in the Bronze Age (c. 2400-500 BCE) was likely sparse. 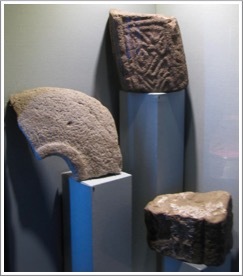 (Life and Death in Monaghan p. 9) During the Iron Age (c 500 BCE - 400 CE) there is, to date, no archaeological evidence for habitation in what is now County Monaghan. During this Early Medieval/Early Christian period there were at least 15 confirmed or supposed monastic sites in County Monaghan. Three of these had high crosses as described below. The monastery at Clones was probably established in the sixth century. The traditional founder of the monastery, Tigernach of Clones died in 549. As evidence of this early date, Tirechan, a seventh century biographer of Saint Patrick "implies that Clones was a well established church in his day.” (McCone, p. 307) During the seventh century, Clones was closely associated with the nearby monastery at Ardstraw. Together, these two monasteries seem to have been rivals, for episcopal influence, with the Columba monasteries of the Cenel Conaill to their north and with Armagh to their east. 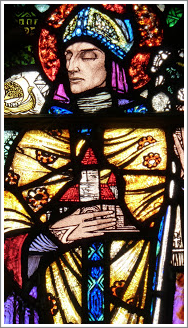 The Columba monasteries looked to the spiritual leadership of Saint Columba or Colum Cille and the monasteries associated with Armagh looked to the spiritual leadership of Saint Patrick. The Hagiography of Saint Tigernach tells us that his father was a Leinsterman and his mother of the Airgialla in Ulster. His story states that, like Patrick, he was captured by pirates. However, Tigernach was taken from Ireland to Britain. Later, he was educated with Saint Ninian at Candida Casa, located in what is now southwest Scotland. Like Patrick, he visited Rome before returning to Ireland. His hagiography seeks intentionally to put Tigernach on a par with Patrick. This reflects the competition for primacy among the groups of monasteries referred to above. Tigernach’s life also angles for influence over Armagh. There is a story there that Duach, an Abbot of Armagh who died in about 548. made a pilgrimage to Clones to visit Tigernach. Point one for Clones. On his way home to Armagh, Duach died. In a vision, God informed Tigernach of Duach’s death. In response, Tigernach hurried to the spot and raised Duach from the dead. Point two for Clones. To top things off, Duach is reported to have said, “Tigernach on earth, Tigernach in heaven.” Game, set and match to Clones. Like most monasteries, Clones was attacked and destroyed several times, in 836, 1095, 1184 and again in 1207. In the seventeenth century Clones was again destroyed following the suppression of the monasteries by Henry VIII. Sometime in the thirteenth century the monastery at Clones became an Augustinian Abbey. 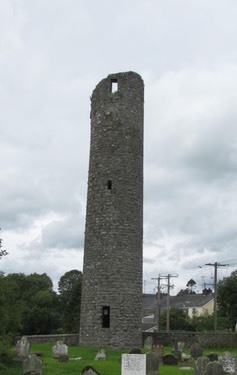 On the south side of Clones, along Abbey Street are the remains of a twelfth century church, a 22m high round tower and a ninth century sarcophagus that is said to house the remains of Saint Tigernach. The original locations of the crosses are unknown, though it would be reasonable to connect them with the Clones Monastery. They are both sandstone and may date to the tenth century. 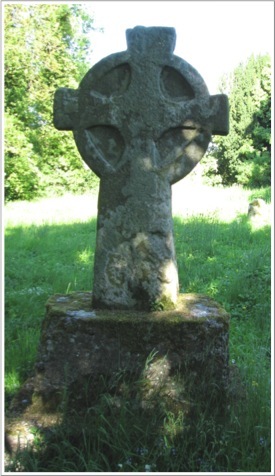 In the present location the cross sits at an angle. 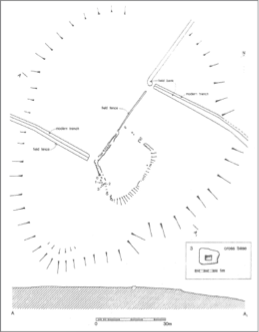 This offers some confusion as the side Harbison refers to as the South-East Face, Meehan simply refers to as the South Face. 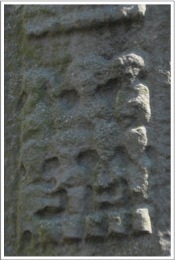 We’ll begin the description of the carvings on the cross there. The following descriptions of the carvings on the cross follow Harbison. Panel S 1 depicts Adam and Eve Knowing their Nakedness. In typical fashion, the two stand under a arched fruit laden tree. They are shown frontally and are covering their nakedness. The serpent can be seen coiling up the tree and facing the left figure, who is Eve. See the photo to the right. Panel S 2 illustrates the Sacrifice of Isaac. Abraham is on the left holding a sword diagonally in his right hand. With his left he seems to hold Isaac, who is bending over the altar holding a bundle of faggots. Above Isaac is a ram with the image of an angel visible behind it. See the photo to the left. Panel S 3 shows Daniel in the Lions’ Den. Daniel stand frontally with forearms stretched out. Above and below each arm is a lion. See the panel below right. Panel S 4 was decorated with small bosses and is much worn. The Head: See the photo below left. The lower arm of the head of the cross contains a horseman and perhaps a riderless horse, above which is a motif of linked bosses. The center of the head is another depiction of Daniel and the Lion’s Den showing as above Daniel and four lions. 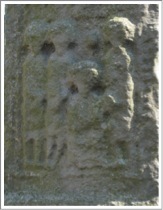 The west arm contains an image identified by Harbison as Cain Slays Abel. There are three figures. In the center Cain raises a club to strike Abel on the right. On the left, with a hand on Cain’s shoulder is God. The east arm may be interpreted as Joseph Interprets the Butler’s Dream. 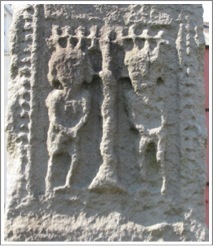 Two figures hold an upright staff resembling panel E 1 of the Cross of the Scriptures at Clonmacnois. The West Side: contains a panel of interlace above which is a panel with small bosses, above which is another panel of interlace. The box at the top of the shaft is decorated with bosses. See the photo to the left. Panel N 1 contains an image of the Adoration of the Magi. Mary is seated and holding the child. A boss above her head represents the star. The other three figures represent the magi bringing gifts. See the photo to the right. Panel N 2 represents the Marriage Feast of Cana. The three figures in the top row seem to represent Mary, Jesus and the steward of the feast. On the bottom row are four figures. The one on the left seems to hold out a container toward the figure beside him. That figure may be pouring water into a jar in front of him and above a row of four other jars that line the bottom of the panel. See the photo to the left. Panel N 3 shows the Multiplication of the Loaves and Fishes. In the center of the image is a basket holding fish. Above the basket is the figure of Jesus. The figures on his left and right hold the basket. Below and across the bottom of the panel twelve small baskets can be discerned. In the story, they held the bread that was left over after the miracle. See the photo to the right. Panel N 4 is part of the box at the top of the shaft. It appears to have been decorated with very worn bosses. See also the photo to the right. The images on the head of the cross are worn and not easily discerned in the photo to the left. On the shaft is one figure turned left. In the center of the head is an image of the Crucifixion. Jesus is depicted with Stephaton (bringing vinegar) and Longinus (with a lance). There is an angel above each of Jesus’ arms. Each arm of the cross bears an image of one of the two thieves crucified with Jesus. Each is flanked by soldiers who seem to be beating them. Getting There: See the Road Atlas page 18, E4. 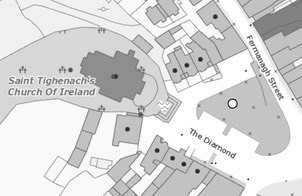 The cross is located in the Diamond in the center of Clones in front of Saint Tigernach’s Church of Ireland. 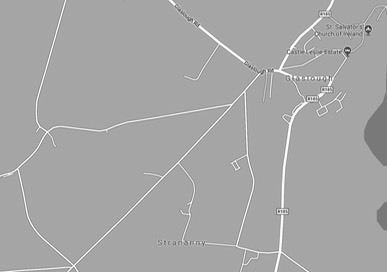 The map is cropped from the Historic Environment Viewer. Whether there was ever a monastery there, or how early the church was established is not know. 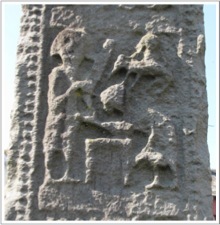 Dates ranging from the ninth to the fourteenth century have been suggested for the High Cross. 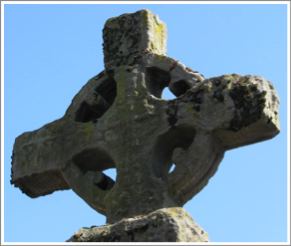 Because Harbison includes the cross as one likely carved before 1200, we are on firm footing to suggest a date between the ninth and twelfth centuries. In the fifteenth century the church was active and many of the priests were members of the Treanor family. Following the Reformation the church and church lands came into the possession of the Church of England. In the photo to the right the remains of the old church can be seen. 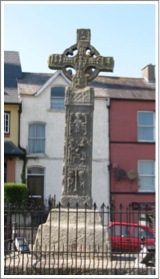 The Old Donagh cross was found in 1911 as will later be described. In 1939 a section of another cross was found nearby (E) in the illustration below. It is in the possession of the Monaghan County Museum (item 2002:4). There is also a cross base on the site known as the “Warty Well” as it is said to offer a cure for warts. The photos to the left and right illustrate the two faces of the cross. 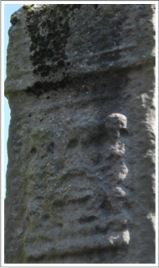 While the original orientation of the cross cannot be know for certain, the crucifixion scene typically appears on the west face of the cross. The image to the right does not have any apparent figural or ornamental carving. The illustration to the left comes from the Moloney article online. Item “A” is identified as part of a door-jamb. Item “B” is identified as a three foot uncured window-mullion. The “Wart Well” or cross base is item “C”. 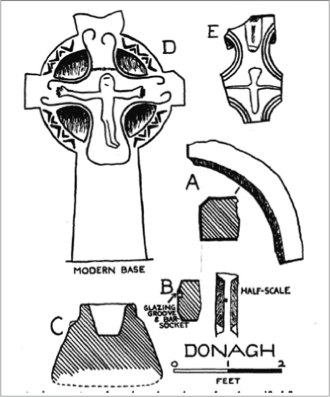 The Donagh Cross is “D” and a fragment of another cross mentioned above is item “E”. Getting There: See the Road Atlas page 18, G2. 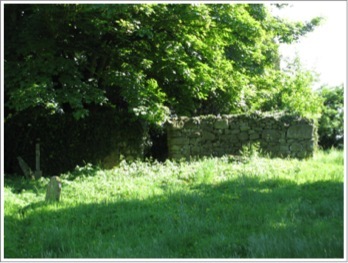 The Old Donagh graveyard is located just southwest of Glaslough. On the west side of Glaslough the R185 takes a sharp turn to the east. Going west from there is the Glaslough Road. Take the Glaslough Road. Just after turning west on the Glaslough Road you turn to the southwest on an unnamed road. The graveyard is located in the rough triangle seen in the lower left corner of the map to the right, near the narrow end of the triangle. Take the northern side of the triangle and a road just visible on the map, near the narrow end of the triangle, will take you south to the graveyard. The map is cropped from Googls Maps. Nothing seems to be known about the history of this site. In the Archaeological Inventory of County Monaghan, compiled by Anna L. Brindley we find the following entry for Selloo, related to the site of the monastery from which the fragment came. 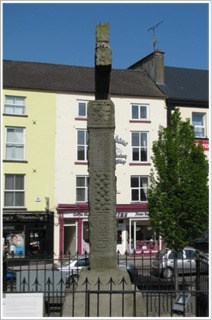 The Cross fragment from Selloo is now housed in the County Museum in Monaghan. It is item #1983:63. Brindley provides a detailed description. The photo to the right shows the front face of the fragment. “The shaft measures 18cms. (wdth) by 19cms. (thickness) and the fragment is 20cms. long. One of the edge mouldings is worn. The broken edges are parallel but diagonal to the shaft edges giving the panels a slightly trapezoidal appearance. This is fortuitous, however, as the panels themselves are quite regular. Decoration is confined to one side (henceforth termed the front face) and consists of interlace patterns contained within a moulded frame between edge mouldings. Parts of two panels are visible, one of which is represented only by the top of its frame moulding. The second panel is filled with a fretwork and interlaced pattern (angular and curving elements). 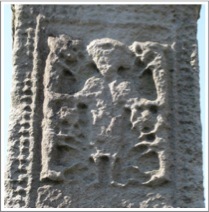 This is too worn to allow full reconstruction but it is apparently comparable to the fretwork panel on the head of the Castledermont South Cross” Below right is an image of the Castledermont South Cross. "The reverse and sides show clear evidence that the shaft is unfinished and may have been abandoned due to an error of design. Parts of two panels are visible on the reverse; both are very irregularly scratched out and have not been completed. One of the horizontal lines was executed at an angle to the sides and subsequently corrected. This and some damage to the second panel may have led to the abandonment of the piece although, as both mistake and accident are shallow, it would have been possible to minimize both. The moulding on one side although outlined, is not completed, while the second moulding is outlined only on the reverse face and not on the adjacent face. This side face has been cut back except for a part of the centre; the other side face has not been cut back, is still rounded in profile as a result and projects beyond the edge moulding by 2cms. If completed, the finished width of the shaft would have been about 15cms. and not 18cms as at present. Brindley’s comments about the unfinished nature of the fragment raises a question about whether the full cross was ever erected and displayed at Selloo. 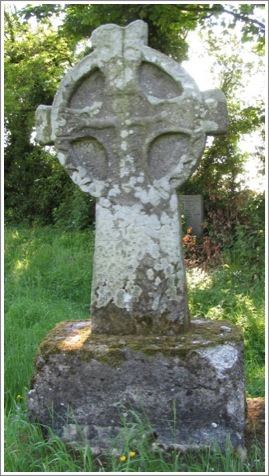 In this regard, it may follow the pattern of other incomplete crosses that were erected, such as the Unfinished Cross at Kells in County Meath. Getting There: On display in the County Museum of Monaghan in Monaghan town at 1 Hill Street. The map is cropped from Google Maps. Bigger, Francis Joseph, “Some Recent Archaeological Discoveries in Ulster”, Proceedings of the Royal Irish Academy, Secton C: Archaeology, Celtic Studies History, Linguistics, Literature, Vol. 33 (1916/1917), pp. 1-8. Brindley, Anna L., (compiler), “Archaeological Inventory of County Monaghan”, Department of Arts, Heritage and the Gaeltacht, 1986. 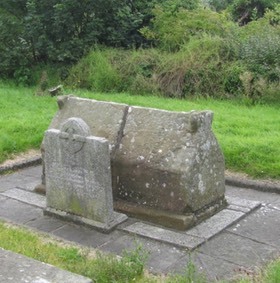 Brindley, Anna, L., “Early Ecclesiastical Remains at Selloo and Kilnahalter, County Monaghan”, Ulster Journal of Archaeology, Third Series, Vol. 51, 1988, pp. 49-53. McCone, Kim, “Clones and Her Neighbours in the Early Period: Hints from Some Airgialla Saints’ Lives”, Clogher record, Vol. 11, No. 3, 1934, pp. 305-325. Bigger, Francis Joseph, “Some Recent Archaeological Discoveries in Ulster”, Proceedings of the Royal Irish Academy, Section C: Archaeology, Celtic Studies History, Linguistics, Literature, Vol. 33 (1916/1917), pp. 1-8. 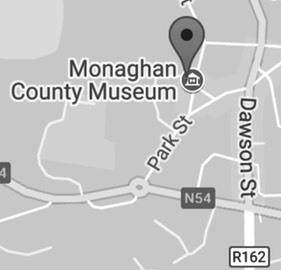 “Life and Death in Monaghan”, Monaghan County Museum in Association with the National Roads Authority, 2003.